Michele's Little World: Purex Fels-Naptha; 120 Years, 120 Winners Sweepstakes! Purex Fels-Naptha; 120 Years, 120 Winners Sweepstakes! 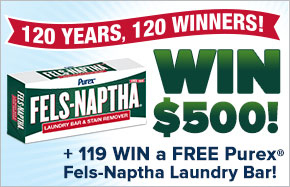 Enter the Purex Fels-Naptha 120 Years, 120 winners sweepstakes! One lucky winner will win the $500 grand prize, and 119 second place winners will receive a coupon for a free bar of Purex® Fels-Naptha Laundry bar. Disclosure: I will receive an entry into a drawing for each person who enters via the link above.